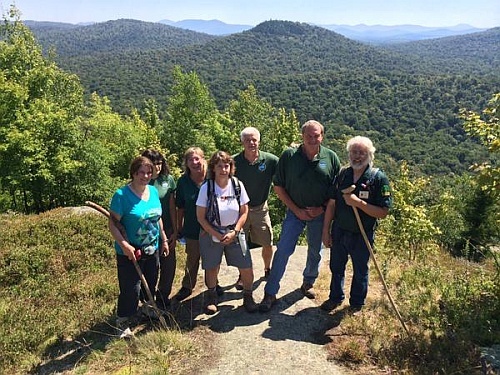 The trail up Goodman Mountain in Franklin County, Town of Tupper Lake, is now complete, New York State Department of Environmental Conservation (DEC) Commissioner Joe Martens announced today. The Goodman Mountain trail is dedicated in honor and memory of civil rights activist Andrew Goodman. The new trailhead parking area and first quarter mile of the trail is wheelchair accessible and ideal for families with young children and people with limited mobility. The trail steepens before turning sharply and ascending to the 2,176-foot summit, where hikers will enjoy scenic views of the Adirondacks. Construction of the new trail was a joint effort amongst outdoor enthusiasts living in Tupper Lake, DEC staff and the Adirondack Park Agency. The trailhead parking area is on the east site of state route 30 just south of Tupper Lake. The trail begins with a .75-mile of gentle grade that follows the original highway leading south from Tupper Lake. The remaining mile is a pleasant stroll to the summit which provides views of Tupper Lake and the Adirondacks. In June 1964, during “Freedom Summer” at the height of the Civil Rights Movement, 20-year old Andrew Goodman and fellow civil rights workers James Chaney and Michael Schwerner were murdered by the Ku Klux Klan in Mississippi while working to register African-Americans to vote. Their murders served to galvanize public support for the passage of the Voting Rights Act of 1965 and resulted in the first successful federal prosecution of a civil rights case in Mississippi. The 1988 movie “Mississippi Burning” was loosely based upon this national tragedy. 2014 marks the 50th anniversary of both Andrew Goodman’s murder (June 21, 1964) and passage of the Civil Rights Act (July 2, 1964). Litchfield Mountain was renamed Goodman Mountain by the U.S. Geological Survey in 2002 at the request of then Town of Tupper Lake Historian William Frenette. That renaming honored the memory of Charles Goodman and his grandson Andrew Goodman. The Goodman Family has strong ties to the community of Tupper Lake, having spent summers here since the 1930s at a camp built by Charles Goodman near Bog River Falls on Tupper Lake. Charles Goodman was responsible for the development of Lumberjack Spring in 1937, near the site of the trail head parking area. The parking lot, bridge, signs and trail were constructed with funding from the Environmental Protection Fund. Total costs were approximately $4350. Goodman Mountain is within the Horseshoe Lake Wild Forest and managed by the DEC Region 6 Lands and Forests staff in Watertown, NY. See more information on Adirondack trails . Governor Cuomo has expanded recreational opportunities for residents and tourists, positioning New York State as a recreation destination, connecting communities to state lands, and improving the quality of life. This year’s State budget includes $6 million in NY Works funding to support the creation of 50 new land and water access projects to connect hunters, anglers, bird watchers and others who enjoy the outdoors to more than 380,000 acres of existing state and easement lands that have not reached their full potential. These 50 new access projects include building new boat launches, installing new hunting blinds and building new trails and parking areas.